Raw details abound, such as exposed masonry. A buried treasure in the otherwise abundantly publicized oeuvre of Maya Lin was her 1993 design for the Museum for African Art, at its former location on lower Broadway. That design featured a brilliant organizational device: a bright ochre cube that accommodated circulation from ground-level bookstore and lobby to basement galleries, framing views through openings and unfoldings in its periphery. Low lighting elsewhere brought a sense of depth to a small-scaled space, and the graphic and geometric punch of the unfolding cube, along with a theatrical use of modest materials, recalled the best work of Frank Gehry. A blast of LA-style pop brought unexpected urbanity to a dire stretch of downtown storefronts. These same spatial and material strategies have been revived in Lin’s new design for the Museum of Chinese in America (MoCA), in the ground and basement floors of the century-old Grand Machinery Exchange, a landmark manufacturing building between Lafayette and Centre streets. 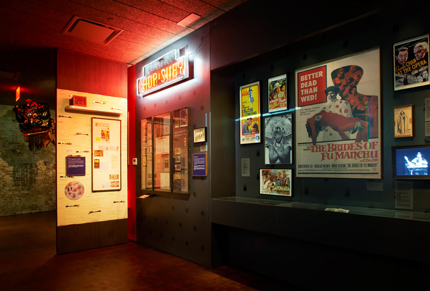 Quadrupling to 12,000 square feet the size of its former home on Mulberry Street, the museum has expanded its institutional mission from a local Chinatown focus to some 500 years of Chinese history in the Americas. The museum opens today. 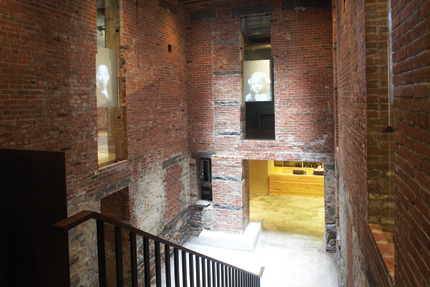 The storefront facade of the museum nods to the economic and cultural touchstones—the laundromat, apothecary, restaurant—many Chinese Americans first experience in the U.S.
That bright ochre cube has become a moody skylit atrium at the base of the Exchange’s light well, lined by the newly-exposed masonry of the original building’s foundation, through which deep openings reveal galleries around the periphery. Distantly recalling the courtyard-house typology of traditional Chinese urban design, the atrium visually organizes a circulation sequence around exhibition galleries, event spaces, and classrooms on two levels. The visible depth of the masonry walls and factory-thick floor plate add a striking monumentality to a space of otherwise domestic scale and affect. Modest materials like MDF and suspended acoustic ceiling panels are used everywhere in precious ways, with clever laminations, glazes, and colorings, producing a luxe-feeling environment at a reported $200 per square foot. In a deft if slightly picturesque gesture, the beams removed to provide a double-height light well along Lafayette Street are reused as the treads of the central atrium stair. Abundant glazing along both Lafayette and Centre streets brings daylight and city views surprisingly deep into the plan. The entryway is suffused with light, though it still echoes darker hues that predominate throughout the museum, albeit Tastefully so. There are two hazards to the design, both of which may pass. The first is that the tastefully low-key, even gloomy palette and overall chiaroscuro inevitably invoking Linns earlier work as a memorial specialist lend a somber air to an institution that aims to celebrate the clamorous vitality of a living community. But with the planned permanent installation of vivid visual and material artifacts, from pop signage to New Year’s dragons, and with whatever random improvisations arise from what will be a densely-used space, the final result will be more balanced. 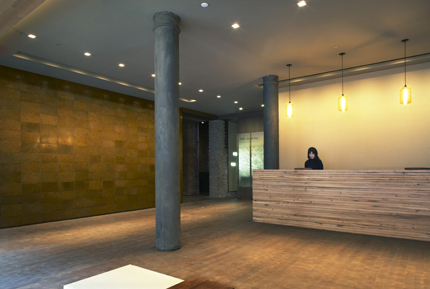 The second hazard is that this particular material and tonal vocabulary (of caramel-colored raw wood and brick along with abraded Plexiglas, patinated bronze, twinkling glass tiles, and wine-dark paneling) suffers from happening to be acutely fashionable right down to the exposed Edison-filament bulbs over the ticket desk. For a glassy storefront location poised between Soho, Nolita, and Chinatown proper, the immediate mood is of a dining or retail environment of the late high aughts. And yet within this context, that’s not without meaning: The permanent galleries, themselves designed by Matter Practice with exhibition graphics by mgmt. design and lighting by Marcus Doshi Lighting Design, acknowledge, and in one case literally reconstruct, the storefront restaurant, laundry, and neighborhood apothecary and tea shop as sites of cultural encounter and social integration for the Chinese-American community. Meanwhile, nothing stays cool forever, and details as simple as the limestone-gray render on the exterior Centre Street facade suggest a lasting civic gravitas resonant with the adjacent former Police Headquarters and the municipal buildings on the nearby downtown skyline. The new museum expands its focus—from Chinatown to the world—and its size—a quadrupling to 12,000 square feet. Sometimes it seems that what New York architecture really needs is more heroic buildings on that skyline, the kind that you can grok from a freeway. But this city, in its profound density and complexity, and its intimate encounter between old and new, survival and arrival, has its own ideas, requiring interstitial finesse at multiple scales and especially on Manhattan Island, where the ground plane is a notional convention more than a geographic fact, requiring a deep ingenuity in cross-section. 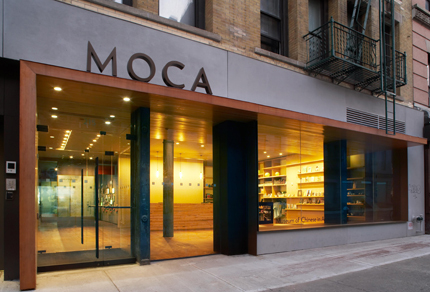 Lin’s MoCA is a minor masterwork in this vein. It unearths the hidden virtues of the banal burrow, yielding something with the seemingly contradictory properties of transparency and revelation. Any real treasure stays a little bit buried.